A turaco, crimson wings spread resplendently in early morning light, a rockfowl slinking, shadow-like through the understory tangles of a West African rainforest, woodhoopoes cackling outside a nest-hole, or a lone Shoebill, standing sentry in a Ugandan Papyrus swamp. 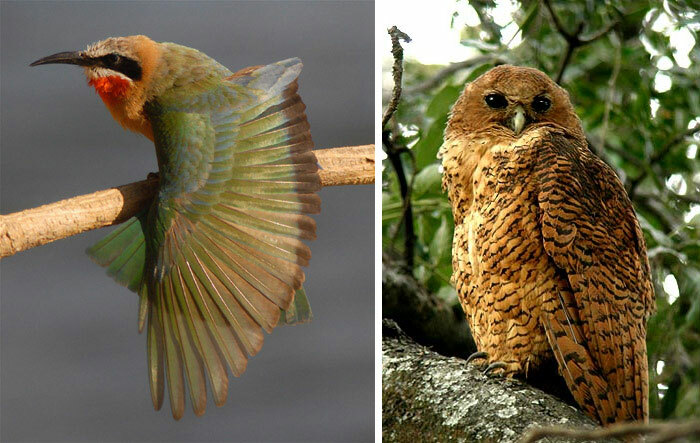 These are unforgettable images of birding in Africa. To give you the opportunity of experience these magical moments on the finest birding tours in Africa, we have teamed up with the experts,Tropical Birding. Tropical Birding’s African destinations are carefully selected for a number of reasons. They are the key destinations for endemic birds as well as being areas where a great diversity of birds is possible on a short tour. These trips therefore produce high lists with many endemics, specialties, and threatened species. We offer tours to 18 of the continent’s 20 Endemic Bird Areas (EBAs) that are in politically stable zones, from the staggering beauty of South Africa’s Western Cape, to the vastness of the montane and lowland forest in Cameroon, to the sprawling Acacia-studded plains of East Africa, to the stark and never-ending wilderness of Namibia’s deserts. Africa has much more to offer than birds. Our trips are often peppered with memorable mammal moments, and it is not unusual to see over 50 species on our birding trips. Our frequent sightings of African mega-fauna such as lions and leopards, and chance meetings with red-cloaked Masai tribesmen never detract from a satisfying birding experience. Choose from the following tours we offer in Africa, operated by Tropical Birding. Namibia is a land of exceptional diversity. The rocky Namibian escarpment dominates the backbone of the country, while the desolate Skeleton Coast and adjoining red dune sea of the Namib Desert fringe the Atlantic Ocean. The north holds Africa’s most spectacular ephemeral wetland, Etosha Pan, part of a national park of the same name. Further east the deserts give way to moist woodland in the stiletto-shaped Caprivi Strip. The Caprivi and adjacent Botswana hold the panhandle portion of the Okavango Delta, a world-famous watery oasis spilling onto the Kalahari sands. With such a diversity of habitats, a trip to this country cannot fail to produce a wealth of exciting birds. Contact us now to book your place on this Africa Birding Tour, or for more information. Tailor-made tours and dates are available on request. This tiny landlocked country supports more than a thousand species, making the proverbial pilgrimage to see the lonesome Shoebill at Murchison Falls and the Albertine Rift endemics at Bwindi National Park incredibly rewarding. Uganda has an excellent infrastructure and a great diversity of habitats, from the papyrus-fringed swamps of Lake Victoria to lowland and highland forests of the Albertine Rift and the northern Guinea Savanna. While the birding is phenomenal, coming face-to-face with the Mountain Gorillas is one of the most touching experiences any wildlife enthusiast could hope for. CLIMATE: Warm to cool, mostly dry, but occasional thunder showers possible. DIFFICULTY: Moderate. We’ll spend time birding some trails, only one of which is steep. Long drives on bad roads are required to get to the birding sites. The optional gorilla trek can be strenuous. ACCOMMODATION: Good to excellent throughout.